These three headless monsters are the latest addition to my collection of Ultima-inspired models. 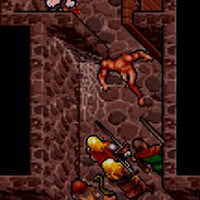 For those unfamiliar, Ultima was a series of medieval fantasy RPGs for the PC, popular in the late 80s through the 90s. I was very fond of Ultima VII: The Black Gate (1992) and Serpent Isle (1993). I have slowly been collecting and painting models suitable for the world of Britannia. I first considered the headless in an August 2008 post. 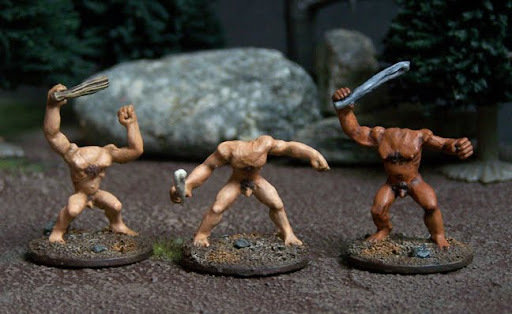 About a year later I ordered Pulp Figures' naked Neanderthal Warriors set*. The animated poses more than make up for their simple appearance (no fancy clothing, armor, etc.) It almost seemed a shame to chop off their heads, but I did! I used some very small clippers, filed, and then filled in a few cut marks with green stuff. These models need alot of flesh paint. I used a mix of Citadel Elf Flesh, Bestial Brown, and some Graveyard Earth to bring the brightness down. I didn't glue any grass on the bases, because I expect these monsters to spend much of their time prowling the dungeon. * I beheaded only 3 of the Pulp Miniatures Neanderthals. I'm keeping the other two along with a clothed set of Neaderthals as part of my small prehistoric miniatures collection. I plan on clothing them in hides and furs using green stuff. Good to see the return of the Ultima Collection. Simple but effective monsters. Egad! Art those peni on them headless monsters?? Naughty-Naughty. Don't blame me on the anatomy. I didn't sculpt 'em!